Old-school tactics require you to get down from your treestand and learn to walk undetected, use a ground blind effectively, or turn the landscape to your advantage. New technology and tactics may help kill big bucks, but these proven old-school methods work just as well. The "Jordan Buck," a former world-record holder, was taken in 1914 by a guy who followed some tracks across the Wisconsin countryside and soon thereafter shot the buck with his Winchester lever action. 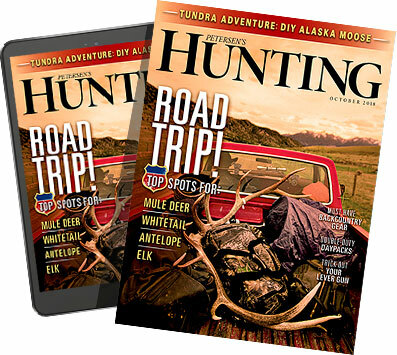 Since those simple days, tactics for hunting big bucks have evolved big time, to the point that some hunters don't even venture outside until they receive a picture on their smartphone showing a bruiser munching at the feeder. More common, however, are the millions of whitetail hunters who climb into a treestand, grunt periodically, and hope a Booner comes their way. Most of these fellas would do well to expand their playbooks. After all, great deer hunters take big deer year after year because their proven tactics have withstood the test of time. So go dig up a red flannel shirt and try one of these old-school tactics. The Benoit family of Vermont is famous for taking huge-bodied bucks by tracking them down in big, snowy woods until they get a shot. The Benoits track bucks because they've found it's the most effective tactic for Vermont's vast pinewood forests that don't have large stores of mast to hold deer but rather require them to cover ground to feed. The tactic itself is fairly simple. Drive or walk logging trails in snow-blanketed big woods to find a track before making the not-so-simple determination that it's big enough and fresh enough to pursue. Then dog the track. Keep a fast pace but walk stealthily and with eyes ahead so you can see a buck bedded or walking ahead before it sees you. Even the shot is challenging thanks to the thick cover and often moving target. The key is to be willing and able to trudge for miles through deep snow to follow the track to its conclusion. It's an exhausting style of hunting — and one that can be dangerous without mad woods skills. Still, it's produced for the Benoit family for 50 years. James Jordan was following deer tracks when he jumped the now-famous 206-inch behemoth, but he wasn't specifically tracking it Ã la the Benoits. More likely, he was "still-hunting" when he stumbled across the tracks and followed them. Though its name is counterintuitive, still-hunting is a method in which a hunter sneaks around slowly and stops often to look and listen. When the hunter moves to new ground, his movements should be so slow that they're nearly imperceptible. The idea is to quietly follow terrain features and sign to find areas that hold deer, then spot a buck before it spots you. It takes great skill, mental discipline, and concentration, but it's fun and effective — especially if three conditions are met. First, it's easiest in the rut when bucks are moving and not quite as wary. Second, still-hunters need a favorable wind. Third, wet ground that stifles the hunter's footsteps is a huge advantage. The best still-hunters constantly scan with binoculars and cover only a half-mile or less of ground in a full day of hunting, depending on the cover. The toughest facet of still-hunting, however, is when trophy hunting. Unlike while hunting from a treestand, non-shooter deer will often pick up a still-hunter's scent and spook as they work around him. This alerts other deer in the area, including trophy bucks. Despite this, a skilled still-hunter is effective not by waiting but by actually hunting. Stephen Tucker of Gallatin, Tennessee, hunts a small leased farm that sits adjacent to suburban housing and a highway. The farm is mostly cornfields separated by woody fencelines and gulleys. In early 2016, he and his uncle spotted a giant deer while farming. The 27-year-old Tucker set up a ground blind on the field's edge, near a scrape he'd found just inside the treeline. The old-school tactic proved prosperous. Just after dawn on November 7, Tucker saw the giant 30 yards away, working the scrape. Soon after, the 49-point, 308- inch non-typical was officially recognized as the highest scoring buck of all time. Though modern pop-up ground blinds have evolved since the days when hunters used natural material to conceal themselves, their use in areas that aren't conducive to treestands will forever remain a great technique. They conceal your movement, your silhouette, and, if you keep most of the windows closed, your scent. Brush them in as much as possible. When hunting big deer, never force your hand by insisting on a treestand. Rather, let bucks show you where to hunt — like near a hot scrape. It worked for Tucker, like it always has and always will. Milo Hanson of Biggar, Saskatchewan, is a huge advocate of deer drives. After all, Hanson did kill the former world's largest whitetail, a 213 5/8-inch typical icon, via a deer drive. And he's taken another Booner since in the same fashion. Guys experienced in driving deer typically focus on a draw or island of cover they know hold deer. Standers sneak within range of the cover and surround it on the downwind side, while the drivers go around to the upwind side and walk slowly through it, looking for a shot. When hunting groups become well practiced in areas conducive to drives, this tactic used by Native Americans way before trail cams were invented is a proven producer. But, safety has to come first. Always be aware of your surroundings and the hunter should never shoot towards the standers. Geography is the number one influencer of natural deer movement, and where the topography hasn't changed, natural food sources, cover, travel routes, and, therefore, deer movement likely haven't, either. Savvy hunters have used this knowledge to their advantage for eons. Ridges are features that often concentrate deer movement. Where a ridge divides food and cover, deer seek out the easiest and safest spot to cross over. Whether it be a saddle that's less steep than the surrounding rim, a finger of cover or a draw where bucks can cross the ridge without exposing themselves, or a natural trail that runs parallel to the ridge, you can bet that if ancient deer knew about this spot, old-school hunters did, too. After scouting a new property that harbors a significant ridge, I found a trail that ran perpendicular to it. I followed it and found a saddle and a trail going up the ridge. Halfway up was a rock outcropping. It was high enough to lend vantage and get my scent over deer walking below but also put me within easy gun range of the trail. Plus, the rocks would guard my silhouette. As if I wasn't confident enough that I'd found a great place, I found an ancient arrowhead nearby. A month later, in early November, I sat with my back against the rocks, looking toward the trail at the bottom of the ridge when a monster buck came cruising. I shot him at 12 yards. Since then I've killed others. I suppose it always will be a deadly tactic, even when I get so old that climbing a treestand might kill me.